I could preach all day long about the importance of including your children in your activities in the kitchen. I KNOW it’s more work. But since when are parents afraid of of hard work? A great way to ensure your children have a healthy relationship with food is to introduce them to homemade foods early on. If you’re new to cooking at home, don’t worry. Take it one recipe and one day at a time. Start with your family’s favorite recipes so that they will be pleasing. Teaching your children to prepare homemade meals will also teach them to save money in the long run. Eating junky, packaged foods or eating out consistently can get expensive! If a child can learn basic knife and stove safety skill while they’re young (though old enough to exercise mature discernment), they will be more useful in the kitchen. This will take some of the pressure of you to do absolutely everything in the kitchen. 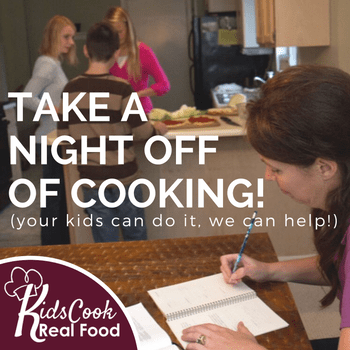 Kids can start to help with meal preparation every day the more they know how to use all the tools. Once a kid is old enough to prepare a basic meal, happy day! You can start to give them meal preparation chores, beginning with simple breakfasts and lunch meals. Eventually, full dinners will be within their wheelhouse. Once my kids started to cook, my whole life changed! My 15 year old daughter makes several dinners, breakfasts and lunches. She also is in charge of making our family bread every week. My 14 year old son makes a slow cooker dinner every week and is in charge of several lunches and breakfasts. He makes the family biscuits because nobody makes them better. My 12 year old daughter makes lunches and breakfasts during the week. She is also our designated sweets baker – she’s amazing. So much so that she plans to open a bakery when she’s older. She’s also in charge of our soudough culture and makes naan bread or pitas at least once a week. My ten year old makes several breakfasts and lunches, too. She’s also our tortilla maker each week. My fiver year old helps with chopping when she can – she’s only allowed to use a butter knife most of the time. She’s also a great stirrer at the pot and is used to being at the store to mix scrambled eggs, etc. She’s also a great taste-tester. It took me a long time before I realized my children were capable of kitchen meal preparation. I just needed to expect it of them, and we worked it out together. Yes, sometimes we eat charred meals. Sometimes not enough food gets prepared for all seven of us. And, yes, we do sometimes eat dinner at 8pm because someone procrastinated. Honestly, you could say all that’s true of my cooking career, too. Life is give and take. This is a process, so take it in your stride. Things will go wrong sometimes – just roll with it. Gathering foods to be preserved in the canning kitchen each summer becomes an opportunity to teach your children the value of good foods, grown well and preserved in health. Do you grow a large garden each year and have zucchini coming out your ears? Or, maybe you’re aspiring to have zucchini coming out your ears and are content for now to simply purchase bulk produce from local growers. Either way, this is the time to talk about why we take the time to can our own food. Why set up a canning kitchen every summer – does it really make a difference? Is canning your own food healthier? Does canning your own food save you money? Why bother to have foods put by in the pantry for the coming year? They’re all valid questions, after all. The first thing to decide is what you want to can together with your children. This will determine which kind of canner to invest in first. Water bath canners are cheaper because they’re a lot less complicated to construct and operate. If you decide on green beans or corn (low acid foods), you’ll need a pressure canner. You’ll need only a water bath canner if you decide on jam or peaches (high acid foods). I prefer to do whatever is simplest with five kids ranging in age from 15 to 5 and that usually means green beans, pickles, jams, tomato sauce. That means that I do have both a water bath and a pressure canner. The water bath canner can be operated by all but my youngest two; the pressure canner is only used by me and my fifteen year old (she’s still learning). I’m there in the canning kitchen the entire time monitoring, instructing and helping, FYI. Aprons – I picked up a bunch of these at a thrift store in all sizes. You can also ask at a home center like Lowe’s if they have any old ones they’re going to trash from their kids classes. If you’re one of those sewing types, you can try this apron tutorial. Super cute. Canning Jars – Have all sizes on hand and always remember to check your local thrift stores and online at places like Craigslist for discounts. Many of our older ladies are aging out of yearly canning and are looking to pass on their jars to the next generation of canners. If you do buy used jars, just be sure to check the top rims for any nicks that will make the seals unable to bind to the jars. Also, if you do buys jars from a retiring canner, be sure to bring by a jar of something you’ve made as a special thank you. I guarantee she’ll love it and you will be teaching something even more important than food preservation to your children. Large bowls – you’ll need a bowl for each child to put their prepared materials into; there will also need to be a few bowls for waste materials. It’s my experience that the kids are a lot less likely to absentmindedly put waste ends into finished material bowls if each kid has their own finished product bowl and share a waste bowl. I’m sure what the psychology is, I just know that I’ve tried it both ways and this is what works for us. So, each kid has their own finished product bowl = less waste ends in your finished canning jars. Knives – have sharp ones for the kids who can safely use them and butter knives for the little who can’t yet. The butter knives will render less than picture perfect results on most produce but who really cares? Children need to feel needed and included just like adults do – let the little ones butcher the cucumber and be happy they love you and want to help you like a big kid. Follow this sequence that plays out in my head as I try to plan the canning kitchen for a batch of pickles. My five year old knows whether a cucumber is clean or not, but the ten year old is more likely to actually clean the cucumber. I let my five year old stand at the sink in my canning kitchen and “wash” the cucumbers, which mostly amounts to flying one of them like a plane around the dish drainer area. The ten year old is actually tasked with getting the cucumbers ready to become pickles. HOWEVER, my ten year old only has the attention span to wash about half a box. After that, it’s time to call in the twelve year old who has the patience to finish the job. The twelve year old and sixteen year old are the only ones with precision enough to cut the cucumbers into uniformly thick pieces without cutting off their fingers, too. If I sit them down to do that, the younger girls can go build a fort. The fourteen year old (my only boy) can sterilize jars in the hot water, which he’s old enough to know how to use without scalding himself. He can also prep the vinegar and sugar that will make our cucumbers into pickles. That mixture gets hot, too, but he’s mature enough to do it without injury. When it’s time to bottle the cukes, spices and pickling vinegar I can call everyone back in to form an assembly line down the table to the stove. It will go like this: fill the jars with cucumbers, fill the jars with vinegar, remove air bubles and wipe rims, put on the seals and lids (double check those Tattler lids* if you have them), but in the canner. Five jobs for five kids = less fighting. Yes, they will actually fight about helping. Even after complaining about helping, they will still fight about helping. Smile anyway. For more information on Newbie Canning Tips as you plan out the great things you’ll do in the canning kitchen this year, please click here. To get a great canning education via DVD, read this article. If you’re new to canning, don’t sweat it – you’ll learn this stuff, I promise! You and the kids can take on the world after handling the summer canning kitchen. I think one day I’ll make us badges to wear at the end of the season – something like you’d see at the county fair. Speaking of the fair, don’t be afraid to check out your local county’s summer fair (U.S.) to see what the kid’s requirements are. You may just end up with a winner on your hands one year. *To learn more about Tattler reusable canning seals, please click here and Melissa can help you learn to use them really well. For a few more safety ideas, please click here and Kathie can keep you thinking. As I said, only the older children and I work with the large, heavy, hot canners. My son and I lift them when needed. The older girls fill and empty them. I’m usually the one who deals with the pressure canner regulation while it’s running its course, though my oldest is learning how. If you’re new to pressure canning, the canner keeps the bottled food under pressure to safely seal the jars and this requires some monitoring during the process. Honestly, it’s not difficult except that a kid can get distracted and wander off, which can be dangerous. I have a short attention span so this is really hard for me, too. However, I’m an adult and have lots of practice doing stuff that I’d rather not do – like babysit a pressure canner. What Are You Really Processing and Preserving? To make the wait more fun, sit down together and play a game at the table. Just shove the remnants of the kids canning preparation to the side – sit down and have some fun together. Save back some jam from the canner and eat it slathered all over some homemade bread. Laugh with each other, or just sit in comfortable exhaustion together. The key is to be together, really together. This togetherness is the thing you’re actually processing and preserving here. The jam is just a bonus. Don’t skip inviting the kids into your canning kitchen because it will make a mess or because it’s more work than if you just did it yourself. The trade off isn’t worth it, please take my word for it. Take all the time you need to teach your children their place in your canning kitchen, in your home and in your heart. While they’re young, this will mean more work for you. But as they age, they can begin to take some of the pressure off you and you discover you live with a fully functioning team of your best friends. Even when the house ends up trashed. Even when they fight. Even when. Here are a few canning articles that are kid-friendly – as in, there are steps in these recipes that can easily be handle by properly instructed children. Buon appetito! Don’t forget, simple canning jobs like green beans and pickles are especially suited to children. I never have them mess with canned corn because it always end up going EVERYWHERE even when I’m doing it. They can help with corn cob jelly, though!